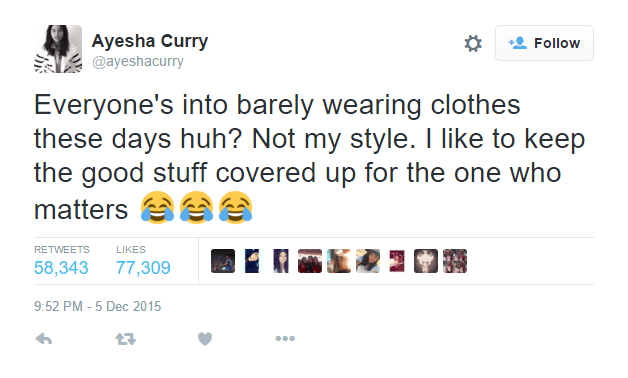 In this week’s patriarchal news, Ayesha Curry, wife of Warriors point guard Stephen Curry, posted about how she prefers “classy” and modest dress over the “trendy” fashion she is seeing everywhere these days. She also suggested that her choices of dress are for her husband’s pleasure rather than her own. Quickly, Twitter fired back explaining that her words were harmful to women. While mainstream media outlets are turning this into a spat or a case of “ruffled feathers,” the truth is, Curry’s words have a long historical arc in the United States, one that usually ends with working-class and poor women of color losing out. 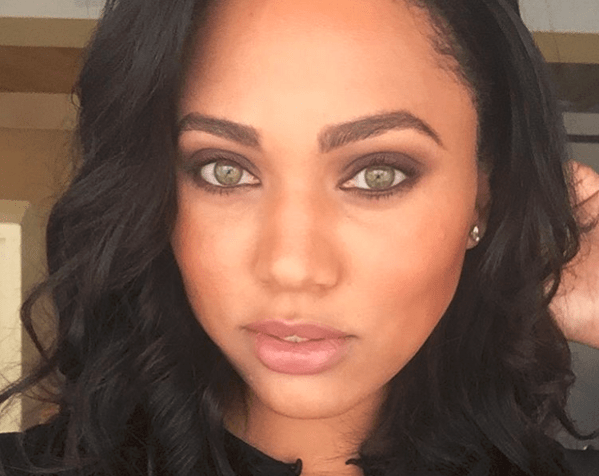 Canadian-born Ayesha Alexander Curry is 26-years-old and has two children with her husband. She is gorgeous. She’s a chef. Her family is beautiful. None of those things can be denied. However, her Twitter rant on Saturday and into the wee hours of the night on Sunday morning came off like the holier-than-thou rhetoric employed by many elites, especially elite Black people, when addressing working-class and poor people of color. The way she juxtaposes “classy” – the state of having class – and “trendy” – keeping up with fashion – implies that the two cannot exist simultaneously. It’s as if she is saying that a woman’s classy-ness can and should be determined by the garments she wears or, better, that she can afford. 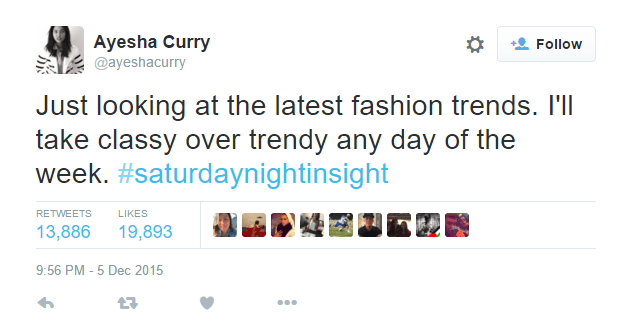 Put simply, what Curry seems to be saying is that trendy women don’t have as much class as she does. And, she is judging that simply by the clothes (or lack thereof) on their backs. Another key message in her tweets is the idea that her “good stuff” should only be seen by one person: her husband. Frankly, I find it alarming that the only good stuff she is planning on ever sharing with anyone is what she keeps under her clothes, but I’m sleep doe. I think women should have plenty of “good stuff” and most of it shouldn’t be estimated by their bodies or presentation choices. Perhaps a core issue with Curry’s words are that they are rooted in a framework of patriarchy wherein women’s bodies exist for male enjoyment and can, therefore, be consumed by public onlookers. This is not a new issue. Since race and class have existed there have been debates about how to hierarchically demean and esteem certain groups of people versus others. Victorian era Whites used class and presentation to deem indigenous folks “barbaric” and “warlike.” They estimated that since indigenous women wore less clothing than their European wives, those women were whorish and prone to hyper-sexed behaviors. In essence, these classless women were seen as less womanly than the White women who had set the beauty and phenotypical standards. And, being less womanly left them vulnerable to sexual and physical violence. In the early twentieth century, elite Black men and women leveraged a similar argument about “class” against working-class and poor Black women in the Reconstruction South. These women often didn’t have the access nor the funds to buy the expensive dresses that their employers could afford. These folks were deemed classless too. It was this attribution of a lack of class that turned into assumptions that poorer women of color were susceptible to moral deviance and criminal behavior. Hence, we see the evolution of terms like “welfare queen” – a classless, hyper-sexed woman of color whose image has even resulted in Senate Republicans voting to defund Planned Parenthood last week. These types of stereotypes have that much power for elites who use legal means to control the behaviors of supposedly classless people – specifically women – of color. 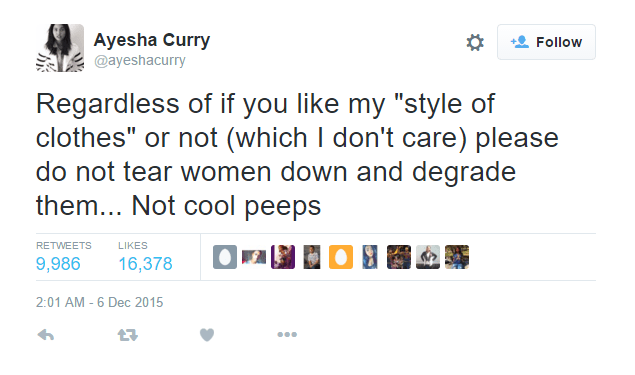 Granted, Curry probably wasn’t thinking that deeply about these things when she popped off these random tweets, but that doesn’t mean she isn’t reinforcing gendered stereotypes and problematic, patriarchal norms about women’s bodies in the process. These types of tropes have very real consequences for working-class and poor women of color whose station in life does not necessarily offer them the same social and political protections as someone like Ayesha Alexander Curry. I guess she didn’t realize she should probably practice a little more of what she was preaching.